Published by Unesco and co-authored by Tarek Atrissi and Huda Abifares, “Visual Narratives from Arabia” is a publication that documents the first Online master module in Design and technology organized by Unesco in 2005-2006, in which a selected group of design students from across the Arab world participated. Long after the course finished, the work on the book that summarizes the experience of the pilot program and showcases the work developed by the students was completed, and the publication was printed and is available for design and communication educators. Preview from the inside spreads of the book “Visual Narratives from Arabia” by Tarek Atrissi and Huda AbiFares, Published by Unesco in 2008. The master module on Arts, Design and Technology for the Arab states was an experimental educational program with the objective to explore possibilities of having a new kind of multi-disciplinary educational program in the Arab States. The Pilot program was targeted for postgraduate students with an interest to use new digital technologies in creative areas, such as art and design. The aim was to bring together students with different kind of expertise to study together and to learn from each other in the context of the cultural wealth in the Arab world. The first Module was offered during the academic year 2005-2006. 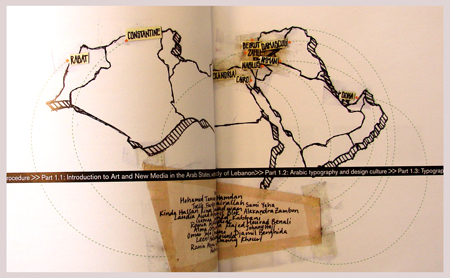 The module was designed an implemented by unesco in collaboration with Academie Libanaise des Beaux-Arts (ALBA), American University of Beirut (AUB), Lebanese American University (LAU), and Media Lab, University of Art and Design- Helsinki. 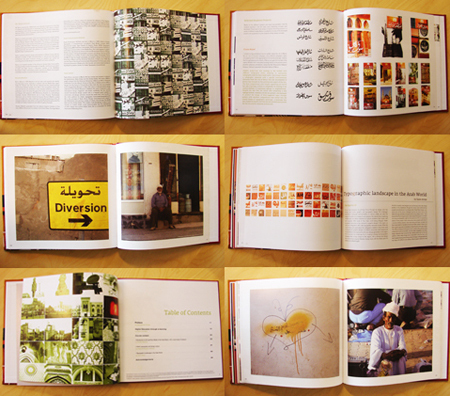 The graphically rich book – designed by Tarek Atrissi Design– contains a selection of some of the most inspiring projects developed by the students in the three online courses: Introduction to Art and New Media in the Arab States (by Ricardo Mbarkho); Arabic typography and design culture (by Huda Abifares) and Typographic Landscape in the Arab World (by Tarek Atrissi). A digital version of the book is available for download at Tarek Atrissi Design’s website on the following link. 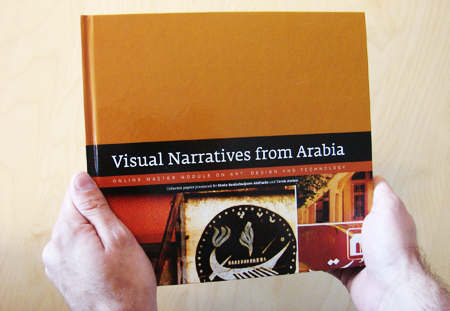 Design educators can contact us directly to request a copy of the book “Visual narratives from Arabia”.